Wedding gowns have a fascinating history full of questions to be asked and answered. Why are wedding dresses white? Did people always marry for love? How has the church, the media, and society influenced the style of wedding gowns from the first ever white dress to the most popular wedding dresses of 2016? As you take a break from trying to decide between all those beautiful wedding gowns—be they classic white or colorful contemporary—take a moment to think about just why you see what you see on the racks of your favorite bridal shop. A little bit of history on those stunning bridal dresses just might help you make up your mind about which one to wear on your big day. So let’s take a look at why wedding gowns haven’t always been white, how love and romance came into the picture, and why you see all those non-traditional wedding dresses in the magazines and on TV. One thing is for sure, though: Gone is the pressure for you to select a stark white wedding dress. The color and style of weddings gowns have always followed fashion trends, and while pristine white is a lovely tradition, believe it or not, it has never been an obligation! Weddings in the 18th and 19th centuries had far more to do with politics and promoting the family bloodline. The nobility often arranged marriages that would either benefit trade or strengthen political ties. Sometimes marriages were banned between two warring factions. Shakespeare’s Romeo & Juliet is a perfect example of young love struggling to triumph over a family feud. In the end, the families were united but only by grief. The marrying age was also much younger, and parents would sometimes betroth their children the moment they reached adolescence if not before. The proposal and accompanying dowry served to protect either land or the family fortune and occasionally both. In some cultures, if a woman’s father died without a male heir, she might be forced to marry a close cousin in order to continue the bloodline. An interesting combination of traditions is seen today in modern England. The monarchy must continue to provide heirs to the throne, but no longer must royalty marry royalty. Both Princess Diana and Kate Middleton were expected to provide an heir, and amusingly, Diana’s two sons born of the union soon became referred to amusingly as “an heir and a spare.” However, while both Diana and Kate are considered “commoners,” the two marriages were deemed acceptable to the royal family since the preference to produce an heir with royal lines on both sides is no longer a demand. No matter the actual family financial status, wedding gowns were considered a significant way to make a public statement regarding just how powerful and wealthy the bride’s family was. As is often the case today, the wealthy set the stage by selecting extravagant wedding gowns made of the finest fabrics and embellished to the extreme. Common folk followed the trends to a lesser monetary degree, so in a way, the idea of “knockoff fashion designs” is centuries old! 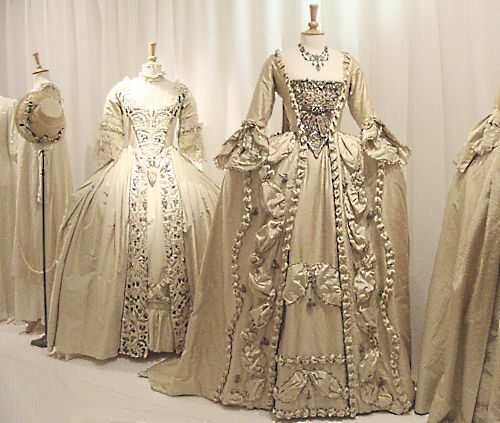 Before the mid-1800s, wedding dresses were usually fashioned in rich colors and elegant and/or rare fabrics. Velvet and silk were popular selections, and some designers incorporated fur. Again, the extravagance of the gown was essential because the wedding became the venue in which to assert the extent of the family’s wealth. It goes without saying that the practice of weddings as a display of wealth is still alive today. Celebrities regularly try to outdo each other, and as recently as June 16, 2016, Sargis Karapetyan, son of Russian billionaire Samvel Karapetyan, married Salome Kintsurashvili in a wedding in Moscow reported to have cost two million dollars! Queen Victoria’s Wedding Dress Changed Everything! In 1840, Queen Victoria initiated the trend toward white wedding gowns. For her wedding with Albert of Saxe-Coburg, she wanted her dress made with the finest lace which, at that time, was only available in white. Her gown made even more of a statement because all clothing had to be washed by hand, so a white dress of any style or for any reason would have been nearly impossible keep clean. Thus, Queen Victoria’s wedding dress also set the precedent for the tradition that a wedding gown would only be worn once. Just as with any other fashion category, wedding dresses follow popular trends. While the church began to view white as the only appropriate color for a wedding dress—white being the best visual representation of purity and virginity—Japan became one of the first countries to initiate the practice of wearing two gowns. Japanese brides often wore a white kimono for the ceremony then changed into a red kimono for the reception. Interestingly, while in Japan red is considered a lucky color—hence a white gown for the ceremony represents the purity of the bride, and red signifies a lucky beginning at the reception—in some English superstitions, the colors red and white symbolize blood and bandages, not exactly a positive start for a marriage! As time went on, the hemline of wedding dresses also began to vary. Beginning in 1915 or so, designers raised the hemlines of daywear a few inches off the floor, creating a wartime crinoline look. This, of course, carried over into wedding dresses, and not only added more options and styles than before but also made dresses more affordable. The cost of a wedding gown is largely determined by the amount of fabric required, particularly in the skirt and train. Less fabric meant lower prices so middle-class brides could afford a more opulent dress by choosing one with a beautifully detailed bodice but a much shorter skirt. Many brides today opt for a shorter hemline, and in recent years, the popular go-to cocktail hour Little Black Dress has an equivalent in white for weddings. As access to international trends became more available due to media including television, magazines and most recently the internet, the variety of choices for wedding dress styles has broadened accordingly. Runway designers of the caliber of Oscar de la Renta and Vera Wang have an even greater influence in bridal fashion, adding color and textured fabrics to the mix. Celebrities, always in the limelight when it comes to new fashion trends, have popularized alternatives to the traditional white gown. Even those who prefer a classic silhouette are adding a touch of color. Gwen Stefani, Reese Witherspoon, and Anne Hathaway are among those who chose variations of pink for their wedding dresses. Sleeveless and strapless wedding gowns came into vogue when many brides and designers discovered that these styles were much easier to adjust and therefore cost far less in the way of traditional alterations. However, the classic long-sleeved lace wedding gown remains popular due to Grace Kelly in her 1956 wedding to the Prince of Monaco, and Kate Middleton who followed suit in 2011. Just as every other choice in women’s fashion, the wedding gown evolves every era following not only fashion trends but also the economy. In the 1930’s and other decades when war was at the forefront, many women chose to either purchase or make a simpler gown in lighter fabrics while some opted for wearing their Sunday best at the altar, perhaps adding a hat with a veil. In spite of the wartime economy and the resulting reduced opulence in fashion, some bridal fashion designers still believe that the 1930s introduced the most dramatic designs. Today not only is the feeling of being in love usually the sole basis of marriage, but the typical bride chooses her wedding gown based on how it makes her feel. Her dress must both reflect her personality and, as a general rule, must also be comfortable to wear. Additionally, the majority of wedding dresses are selected, not just on current trends and personal preference, but also to coordinate with the overall theme of the wedding itself. In spite of the trend toward easy-to-wear wedding gowns, there are still brides who are willing to endure a little discomfort in order to wear the most beautiful and extravagant dress she can afford. Tip: For some fabulous suggestions on how to choose your wedding theme and the perfect dress to go with it, check this out. Destination weddings came into vogue in the 1970s. They’ve remained a strong influence both in wedding planning in general and by association, wedding dress design. Garden, beach, and outdoor on-location weddings call for much simpler lines and are fashioned with fabrics meant to flow gracefully in the breeze. The tried and true classic silhouettes in wedding gown design will doubtless be the first choice for brides who want a traditional wedding because they represent the beauty and solemnity of the marriage ritual. Even so, there were never any hard and fast rules that a bride must only wear pristine white. Designers have been making wedding dresses in off-white hues for decades. Ivory, cream, and the soft glow of the shade known as “champagne” are now considered classics, and in recent years, designers have added a few more neutrals to the mix such as ecru and taupe. Stylish accommodations have also been made for brides who want the look of a long-sleeved dress without the fitting issues. Hence today’s bride can select from a variety of boleros, jackets, and shawls, either ready-made and included with the gown, or custom designed to either match or coordinate with the dress itself. Some brides find that choosing the neckline is the most challenging part of selecting a gown. After all, the neckline frames your face, defines your hairstyle, and also influences the type of jewelry you’ll wear on your wedding day. The best way to know which necklines and overall silhouettes look most flattering on you is to take photos of yourself wearing different dress styles. Today’s cell and smart phones make it easy to see right away which gowns look best on you. You’ll also find out how well the shade of the fabric complements your skin tone and if the finer design details of the dress photograph well. Tip: One of the best ways to find your most flattering silhouette is to use a style guide that helps you select your wedding dress by body type. With so many options to choose from, you may feel overwhelmed trying to narrow your options down to just one dress. However, the sheer variety in modern bridal fashion is exactly what makes today’s weddings so much more exciting and fun to plan! Your gown no longer has to reflect your family image or prove how wealthy you are. You can now choose a wedding dress that reflects you and lets your personality shine through because you as a happy bride to your groom are what you want your guests to remember. Your wedding gown is your own little piece of history, so while we hope you’ve enjoyed this little diversion, it’s now time to take a deep breath, grab a friend and your cell phone, and get back to trying on dresses!